Sorry, this item is no longer available. Please visit our Scented Bath Salts page for our new collection of amazing scented salts. You’ll feel as if you’re taking a stroll through a lush garden of lilacs in the springtime once you’ve added our Sweet Lilac Bath Salts added to your bath. The delicate, sweet aroma of lilacs is so calming… a great bath salt to help you relax at the end of the day. No time for a bath? Use as a shower salt and let the smell of lilacs fill your bathroom, creating that peaceful atmosphere (see usage suggestions below). 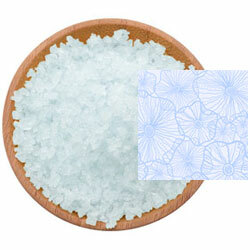 A fine/medium grain blend of Pacific Sea Salt with the delicate, floral scent of lilacs in a light blue color. Benefits: A relaxing bath salt. Relaxation Bath - Pour a large handful into a running bath for a relaxing soak. Shower Salt - Take a small handful and massage gently onto wet skin to exfoliate your skin. Or, sprinkle a small amount onto the shower floor to cleanse your feet while making your bathroom smell wonderful. Ingredients: Pacific Sea Salt, Fragrance*, Glycerin (Vegetable Glycerin), Tocopherol (Vitamin E), Aloe Barbadensis (Aloe Vera) Leaf Juice, FD&C Blue 1 Lake. *made from a blend of essential oils and other natural plant extracts. ​We are the salt of the Earth. From our luxurious bath and spa salts to our worldly gourmet sea salts, we strive to keep you impressed. inside out. Our core mission is to increase our customer's understanding of the wondrous benefits of salt. © COPYRIGHT 2002-2019. SAN FRANCISCO SALT COMPANY, EPSOAK, SHERPA PINK, & MINERA ARE REGISTERED TRADEMARKS.